Nestled in a cove on a high hill overlooking the Colorado River, the amphitheater is the first outdoor performance facility built on the Lower Colorado River. The 5,500-square-foot facility features a Texas-Czech style and includes an open stage, stadium seating for 400, dressing/meeting rooms, restrooms, and two prop storage areas. Music is very special in Czech life. The Czech saying Muziky, Muziky (Music, Music) adorns the top of the stage. The facility is available for rent and used for musical performances, theatrical plays, presentations, and outdoor weddings. Performances are open to any qualified group and are not limited to those with a Czech theme. Thanks to an initial grant by the Lower Colorado River Authority (LCRA) and a matching grant by La Grange resident Sanford Schmid, the amphitheater was built in 2000. The facility was designed by architect Barry Moore, FAIA, president of SJKB, a Houston-based theater architecture and consulting firm, and constructed by Bohlmann, Inc. of Schulenburg, Texas. 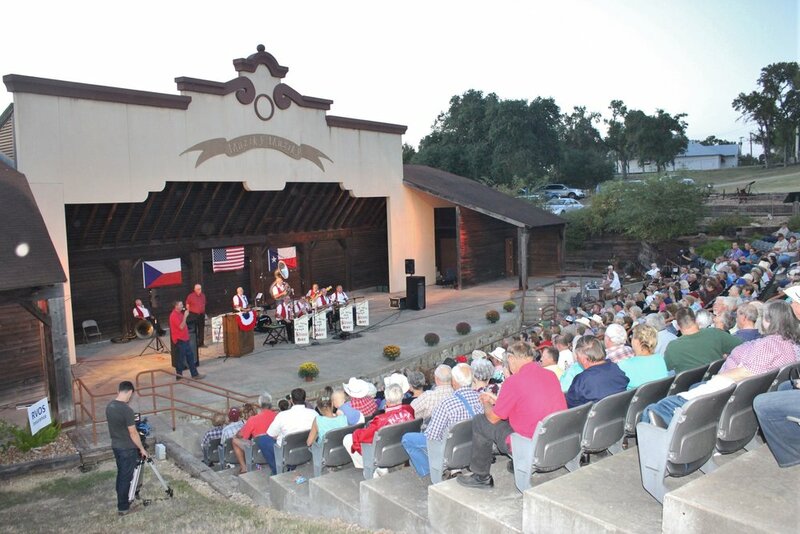 The amphitheater was dedicated on November 1, 2003 with remarks by special guest, Dr. Ivo Broskevic, Czech Cultural Attaché of the Czech Embassy in Washington; Raymond Snokhous, Honorary Czech Consul of Texas; Ed Janecka, Fayette County Judge; Mr. Schmid, and Retta Chandler, TCHCC President. Their speeches were followed by a spectacular performance of the Dvorana Dance Group from the Czech Republic. Mr. Schmid’s generous gift resulted in a successful capital campaign followed by contributions from Union Pacific Railroad, the heirs of the Leo A. Legler Estate, and many donors from all parts of the state. In 2004, a concession area and restrooms were added at the entrance to the amphitheater. Designed by Roger Kolar of Negrete & Kolar Architects of Austin, Texas, it was built by Minarcik Construction Company of La Grange, Texas. In 2015, the Amphitheater Enhancement Project, funded by LCRA and Mr. Schmid, allowed the addition of a dancing area and improvements to the entrance and walk making it easier and safer to access. 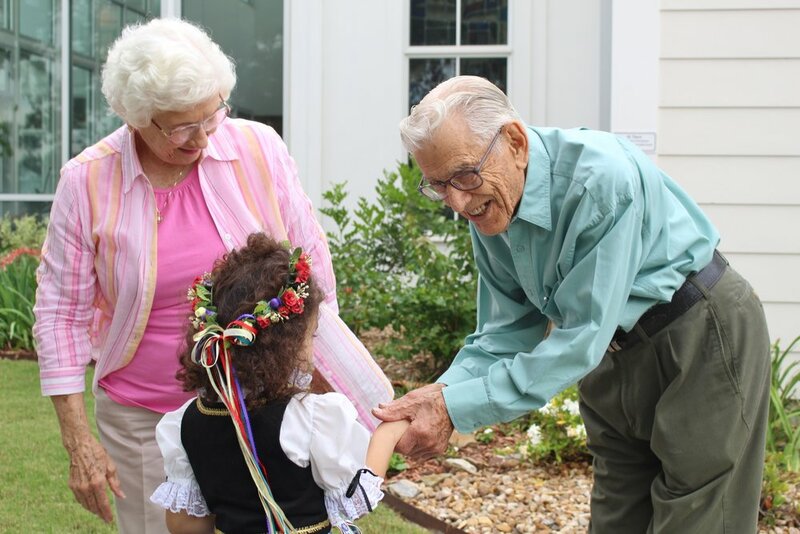 Sanford and Mannie Schmid greet a young visitor to TCHCC Mayfest 2016. Mr. Schmid traces his Czech ancestry to Tobias and Helena Kovar Dockal from Sloupnice, Cechie, who arrived in Galveston in 1870. Born in Austin County, Mr. Schmid graduated from Fayetteville High School. He grew up in the Industry area at Das Haus, the home of his great-great grandfather Dr. Ernst Witte. Donated by Sanford Schmid and his mother, Annie Schmid, Das Haus is now preserved by the Texas German Society. In addition to his interest in historic preservation, Sanford Schmid has been active in other civic affairs. In 1959 he served in the Texas Legislature as a representative of District 45. He continues to support numerous projects in Fayette County including the continued progress of TCHCC.